My sprouts are doing great! Well, at least some of them are, some of them forgot that their goal in life was to grow and become plants. 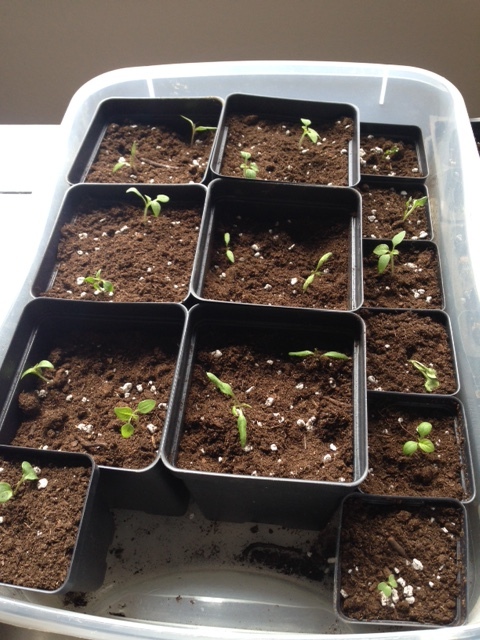 So since it has been 3 weeks since I first planted the seeds I replanted the containers where nothing had grown. The only problem being that I never labeled what I planted the first time so I had to guess at what had come up and what hadn’t. Which is so easy to do when things have 2 or 3 leaves on them….not really. So I may end up with a gazillion tomatoes and no peppers or something weird like that. Oh well. Do you think I remembered to label the seeds when I replanted…not exactly. But for those that did remember to grow and actually become plants, today was a big day…they graduated from little seed containers to big seed containers. Once plants have their 3rd leaf then they are safe to transplant into a bigger container so they can grow more. Some of my bigger containers are big enough that I actually end up putting two plants in them. And this is where they will stay until they get planted in the ground…on or around Mother’s Day. I also decided to start a bunch of flowers inside. I always plant a bunch of seeds in the ground and then usually end up pulling the plants up because I forget about them and weed the flower garden. So this year I decided to start a bunch indoors thinking that might prevent me from killing my own plants. So far it seems to be working. Many have started to sprout, I am looking forward to planting them in the flower beds when they are big enough. I planted statice, snap dragons, lupine, delphinium, foxglove, and stocks. I was pretty scientific about the whole thing too, I dumped all the seeds into a zip lock baggie and then pulled some out and scattered them in the dirt in the containers and called it good. I think gardening is much more an art than a science anyway….just go with what works and don’t fret about what doesn’t. Each little part makes the world a little more beautiful. Previous Post And Now We Are Chicken People….